The "JioPhone" with its native essence and unique features, is here and almost ready for pre-bookings. Nationwide, after the success of unmatchable Jio telecommunication services, the Reliance Industries have well packed a bucket of smartphone traits with Jio connectivity that aims a larger section of Indian population. A phone for all indeed, it not only comes with an easy to use keypad but also incorporates some properties of a standard smartphone. Before we go into its detailed analysis, let us not forget that from 5:30 pm onwards the phone will be up for grabs. Any one interested to harness the pocket-size device can give a shot by spending only INR 500. Trust me, it doesn't look the best but as we know already, beauty stays with the beast. Having an old attire of keypad phones, the Jio phone is simple, compact and sports a 6.09 cm QVGA display. However, the harmless look doesn't deprive it of having a 2000 mAh battery inside which is simply much more than required for keypad phones. Also, it is equipped with a nano SIM slot. The device can last up to 12 hours of talk-time and 15 days when in stand by mode. However, the real fun lies within its capacity to support 4G LTE, enabling it to enjoy all the super saver deals that Jio provides. Powered by a 1.2GHz Spreadtrum SPRD 9820A/QC8905 dual-core processor, the phone promises to run decently with 512MB RAM. Storage wise, it offers a 4GB internal storage but also has a microSD expansion up to 128 GB. Interestingly, the phone provides Wi-Fi support, NFC, Bluetooth 4.1, GPS and USB 2.0 support with a bag full of Jio apps. Out of many, JioTV, JioCinema, JioPay, JioXpressNews are worth mentioning. 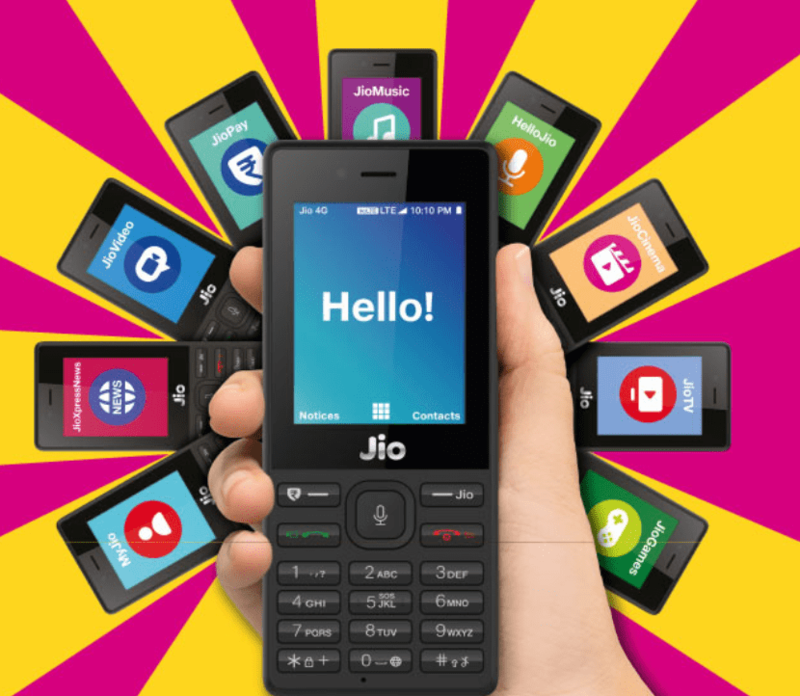 Moreover, the phone comes equipped with a Jio Assistant that can make calls, compose SMS, search on Google, open apps and follow basic commands. Supporting 22 Indian official languages, Assamese, Bengali, Bodo, Dogri, Gujarati, Hindi, Kannada, Kashmiri, Konkani, Maithili, Malayalam, Manipuri, Marathi, Nepali, Oriya, Punjabi, Sanskrit, Santhali, Sindhi, Tamil, Telugu and Urdu, becomes a symbol of unity in diversity. With a JioMediaCable, sold extra, one can connect the device to any television. Altogether, it is one of the development India was looking for given the craze for Jio SIM. With this purchase, you can avail Jio Dhan Dhana Dhan card for Rs. 153 that gives you free voice calls, unlimited data, free 300 SMS and much more. One more reminder folks - The pre-booking starts in an hour. Will wait for your feedback and opinion. I see that the pre-booking of the phone has been suspended. Those who've booked the phone, please do share your reviews and feedback with our fellow engineers. AFAIK, the phone does not support WhatsApp and Video Calling. Smartphone users who're opting for this phone - what's the deal?